Are you always on the hunt for that baby shower gift that is one of a kind? Do you find yourself wishing that your own baby had things that were more unique? I am one of those people, which is why I was over the moon when I discovered Dillyhearts! 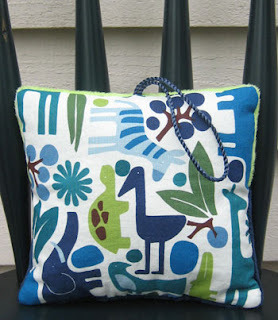 Vickie, the owner of Dillyhearts, has an obsession with finding unique fabric (here! here!) for her line of wonderful baby gifts, and she does an EXCELLENT job! 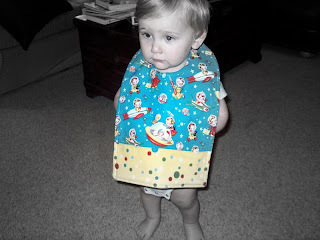 Here's Noel sporting his super cool space kids Toddler Bib. I have been looking for something, anything in this fabric for years, and finally it's mine...er, well, it's in my house anyway and I can ogle over it whenever I want! We've also got little Miss M. in her mod mocha Toddler Bib. Don't get her confused with Twiggy! 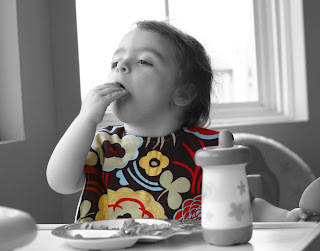 These bibs are great for that messy toddler. You can see for yourself how big they are...no pizza sauce will sneak past these babies! Some other things you'll find when you shop Dillyhearts are super soft, colorful, and "reversible" chenille baby blankets, burp cloths (that are almost too pretty to allow burping! ), beautiful dresses, play aprons (even styles for BOYS!! !, toddler pillows for older kids (that you can even get personalized), groovy bags for mom, and one of the newest items: toothfairy pillows! Vickie is proud to donate 5% of her website earnings to Seattle Children's Hospital & Regional Medical Center. You can read comments from many satisfied customers too...clearly, Vickie puts 100% of herself into her work, and you can tell by the quality craftsmanship of her products. You'll be able to see this for yourself, if you're the lucky winner of this TOOTHFAIRY PILLOW that we'll be giving away next week! Find out more at her blog. I'm thrilled to have discovered a retailer as awesome as Dillyhearts! DON'T FORGET TO ENTER THESE CONTESTS TOO!